Below are several demos or tutorials for using VisiWave products to analyze your wireless networks. This short video quickly introduces you to the main features of VisiWave including creating a new survey, collecting survey data, and creating a report. This video goes into more details on how to create a report within VisiWave. It shows examples of different graphs, how to change the appearance of a graph, and how to create a PDF report. This video shows you the basics of creating a predictive site survey using VisiWave. This video shows how VisiWave integrates with Chanalyzer. By utilizing both products, you can map where the interference occurs using VisiWave and replay the specifics of the interference within the powerful spectrum analyzer, Chanalyzer. A large collections of short videos that show you how to use most features of VisiWave Traffic. Get started using VisiWave to collect Wi-Fi survey data and then visualize the wireless coverage using Google Earth. 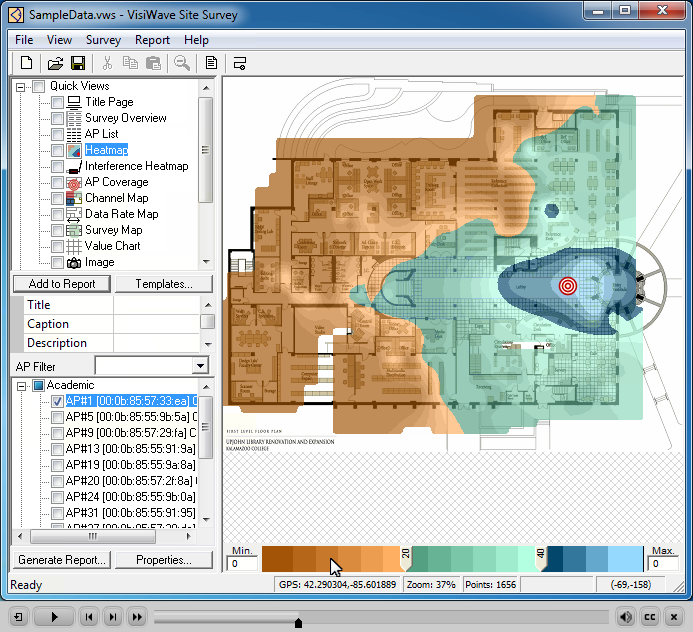 Use VisiWave with a GPS device to collect Wi-Fi survey data and then visualize the wireless coverage using Google Earth. Visualize your VisiWave site survey data in Google Earth. See how Google Earth is used to view the coverage graphs and data points. Same as above but using smaller file if your network connection is slow.